So, so much to eat and try. 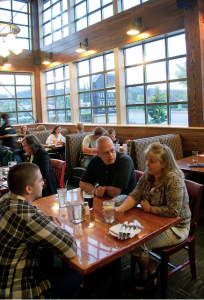 In 2010, nearly 30 new eateries opened in Kitsap County, and nine got new owners. Some new eateries were highlighted in various Kitsap Sun articles and blog posts throughout the year, though some we admittedly missed. I plan to visit the new restaurants in more detail in the coming months and invite you to share your impressions on any of the new eateries of 2010. I’ll be stretching this blog post out into four parts through this week because that many restaurants makes for one awfully long blog post and — let’s be honest — so I can get as many eyeballs back to the Food Life blog as I can. 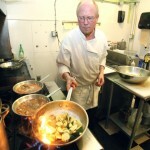 John Strasinger the owner/ chef at the new Bay Street Bistro cooks zucchini at the downtown Port Orchard location. Bay Street Bistro – I talked with chef and co-owner John Strasinger about his new restaurant a month and a half after it opened in late July. 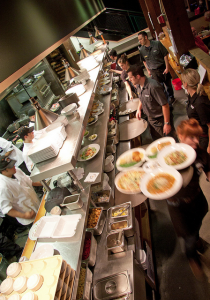 Strasinger tries to procure as many ingredients as he can from local farmers, and has worked to build up the restaurant as a neighborhood dinner spot. Recently, they’ve started serving lunches and this fall put a savory gorgonzola-laced cheesecake that’s just as good as a mouthful on its own or on a cracker. Boogaloo’s – The name filed with the health department is “Boogaloo’s Shrimp Shack”, but the sign out front says Boogaloo’s Bar-B-Que. I’ve also seen it referenced on sandwich-board signs around town and in a Kitasp Sun sports story as Boogaloo’s BBQ and Boogaloo’s Barbeque Pit. Whatever it’s called, it opened this summer in a tiny building on Bremerton’s waterfront boardwalk. Owned by Tony Thomas of the former Soul Brothers restaurant chain in Bremerton, which had its local heyday in the late ’90s. I was away in college, so I missed it the first time around, but word is that the brisket is just as heavily smoked and tender as it was back then. Burger Me Now – This spot on the plaza at Highway 303 and McWilliams, between Safeway and Toad House is exactly what the name would imply: a burger joint. Burger Me Now offers a variety of burgers, from a $6 standard to a $7.45 teriyaki chicken burger as well as seafood and chips. I’ve not tried it yet. I can’t seem to go near the Toad House without wanting a beer, and get distracted. We’ve been talking about it for months, but someday Mike Moore and I are going to put out a roundup of burger joints — including this one — on the Kitsap Peninsula and immediately surrounding areas. Chet’s Place – This is the latest offering at 610 Callow Avenue in Bremerton, spot to a former Mongolian Grill/Nightclub, the Ponderay Cafe and Lounge (gosh, I loved the Ponderay’s German sausage and potato pancakes), El Camino’s and others. Chet’s Place serves up soul food including grits, hush puppies and fried okra. It also has a lounge because there has to be some place to get a 9 a.m. beer on Callow Avenue, right? Deane’s Pizza a& Subs – I feel that I almost have to like this place since I almost share a middle name with it. That said, I haven’t actually tried it, but if you want to, it’s across from Fred Meyers in that plaza with the 24-hour fitness place and Emerald City Smoothies. They offer — you guessed it — pizza and subs and opened in May. The pizzas offerings seem to go beyond the standards with things like taco pizza and alfredo pizza. Der Blokken Brewery – This Manette brewpub opened in spring to fanfare from the local brew geek community. 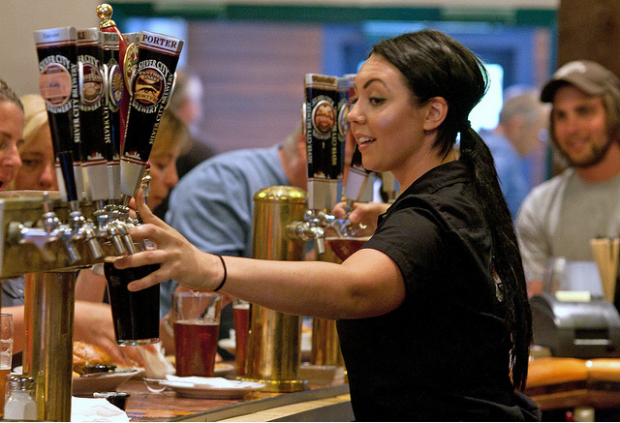 In addition to a hard-to-find-on tap lineup of beers, such as Old Rasputin Imperial Stout, 90 Minute IPA from Dogfish and Der Blokken’s own Black stout, they offer a lineup of pub fare including a gorgonzola burger, chicken wings, occasional steak special and a personal favorite poutine, the gravy and curd smothered fries of French Canadian fame. El Pueblito Mexican Restaurant – This Gig Harbor-based restaurant opened a Port Orchard branch on Lund Avenue, near Bethel, this spring. It’s family-style Mexican with dishes such as arroz con pollo, burritos, enchiladas, etc. The handful of online reviews for this place are mixed.